The area of Okazaki is famous for the popular sightseeing spot of Heian Jingu Shrine. Today’s restaurant, Yamamoto Menzou may be the most popular udon restaurant in that area, and indeed the most popular or second popular in the whole of Kyoto. The restaurant was started by the owner-chef, who used to be an office worker, because he wanted to become an entrepreneur. Nowadays it’s so popular there are always people lining up in front of the restaurant. Why is Yamamoto Menzou so popular? I think it’s because of the great service everyone at the restaurant provides. No matter how busy they are, they still find time to give lap blankets to the people lining up in the cold, they give you water right after you finish eating spicy udon, and of course the greatest one is that they use quality ingredients to make the dishes. Because of these things they do to make the customers happy, the udon of Yamamoto Menzou is really delicious and the customers keep coming back for more. 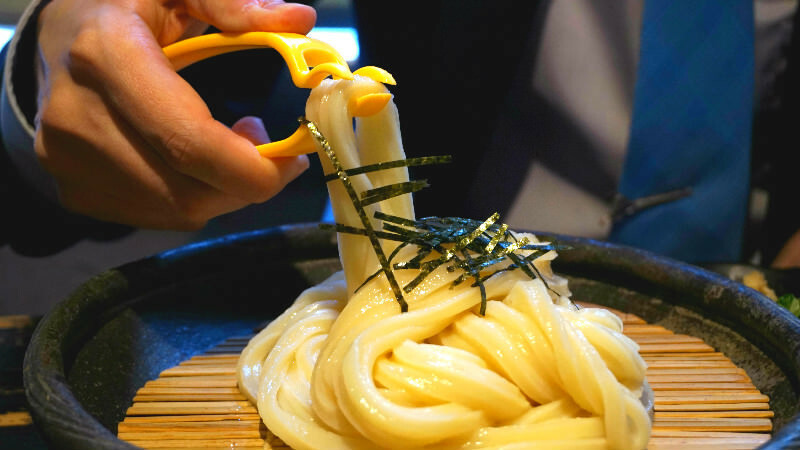 I think it would be a great idea to include one of Kyoto’s most famous udon restaurants, Yamamoto Menzou, into your sightseeing itinerary of the Okazaki area. This place will make all who visit leave satisfied, and the taste and hospitality of this restaurant are both without peer. This dish is the most popular at Yamamoto Menzou and it’s topped with flavored oil made at the restaurant from white leek, garlic, and many types of oils. You get one of Yamamoto Menzou’s specialties, deep fried burdock with the udon. The spicy hot and rich soup blended with the fragrant flavored oil creates a delicious taste that is hard to describe in words. Usually udon in Kyoto specializes in the simple and gentle taste of dashi, but this red Menzou special is a chance to experience a different taste. Yamamoto Menzou’s great udon is not only about hot noodles. To those of our readers who wish to enjoy the taste of the noodles themselves and enjoy them a bit al dente I recommend the cold noodles. The juicy looking lustrous noodles overflow with freshness. The feeling you get when you dip a lot of udon quickly in the soup and then slurp them up is great. The chicken tempura you get with the noodles are big and juicy. I recommend dipping the chicken tempura in the udon’s soup and eating them together with the udon noodles. *Yamamoto Menzou’s udon noodles are really long so you get special clippers with the udon. Use this to cut the udon into easy-to-eat lengths. All of the menus have pictures. 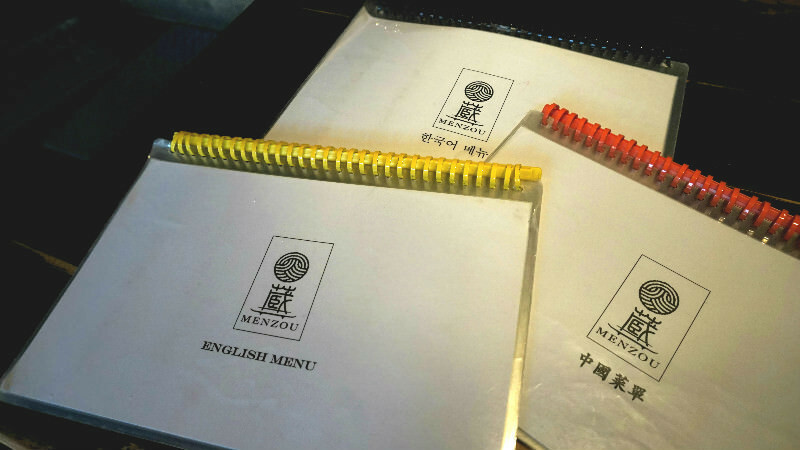 They have menus in English, Chinese, and Korean. 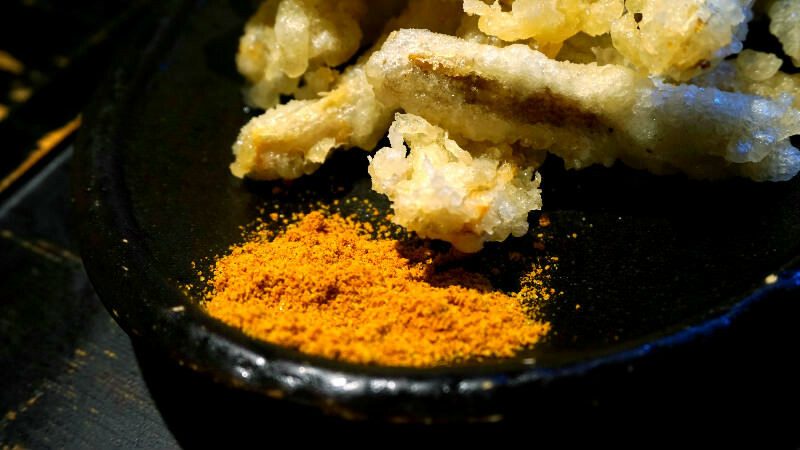 You get curry salt with the burdock tempura. The taste is completely different without and with this salt. First taste the burdock by eating it without the salt, and then eat it with the salt enjoying the difference in taste! These are the noodle clippers you get with the udon. Put the noodles into the clippers and lift them up, and then press the clippers together to cut the noodles. The noodles that are dipped into the soup are difficult to eat if they are too long, so I recommend cutting them shorter with these clippers. This isn’t really a point about ordering at Yamamoto Menzou, but the staff is extremely polite, and the restaurant is overflowing with hospitality, so you should pay attention to it too. By the end of your meal the staff say “This is on the owner” and bring you a small portion of almond jelly. Enjoy the great service at Yamamoto Menzou to the end. I really like Yamamoto Menzou! I would like to recommend the cold udon on a bamboo sieve to those who want to enjoy the taste of the noodles themselves, but my favorite is the spicy udon! The taste is ethnic and strong, but you can still taste the deep taste of dashi stock and the spongy udon noodles, so that is why I really like this dish. If you are going to Okazaki you have to go to this restaurant! 11-minute walk from Keihan Line Higashiyama Stn. The restaurant is really popular and many people come from far away, so you can’t avoid lining. Even on weekdays you may have to wait 30 to 60 minutes, so I recommend going to Yamamoto Menzou with time to spare. Also note that they are only open from 11 a.m. to 14:30 p.m. on Wednesdays so be careful if you plan on visiting on a Wednesday. The staff can only speak simple English, but they will use gestures to serve you politely. They also have the menus in English, Chinese, and Korean with pictures so you should have no problem ordering. Seating for 18, 10 counter seats and eight table seats.